Then the first flower opened up. It was pale pink! As much as I wanted to keep my hopes up, I wasn’t color blind. It’s definitely not Sweet Autumn. But what is it? 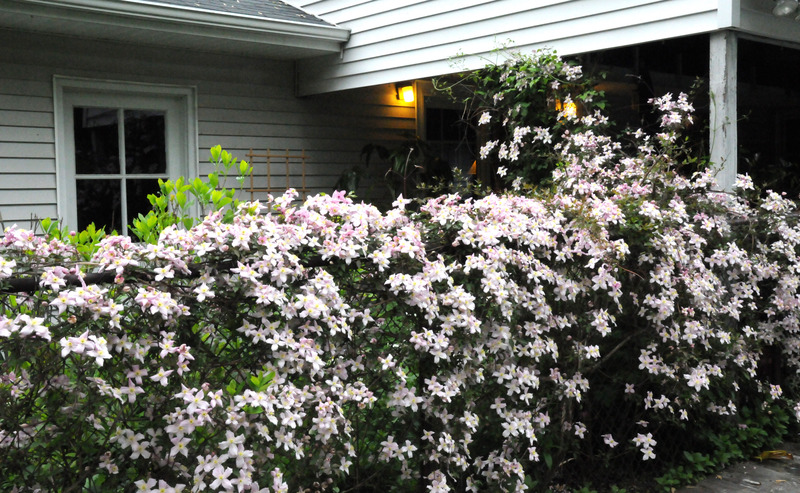 I searched my library and online, looking for any large, single, pink, fragrant clematis. Finally, it’s a Clematis Montana var. Rubens ‘Tetrarose’. A native of the Himalayas and Central and Western China and can grow close to 30 feet long. But what surprised me most was that it ‘s not supposed to grow in zone 5 (our zone); it grows in zones 7-9. I mentioned that I have a Clematis Montana in the garden to one of the vendors at local farmer’s market who sold variety of Clematis and she insisted that I cannot grow it in this zone. The next time I brought pictures along, she didn’t want to talk to me after that. It was a really wonderful surprise and now I love it more than my original choice though I ended up getting that later on. When all the Montana flowers opened, the fence was covered with mauve pink and the whole area was scented with wonderful vanilla fragrance. I love to get my nose close to it. Now we can hardly wait for spring. It blossoms right after the Daffodil fades, and that’s when the wave of flowering in our garden starts. The only thing I would wish for is that it could bloom from spring right through autumn. At this point I’m satisfied with my luck. I got the ugly fence well covered… too well I think since it’s climbing on not just the fence but every plant that it can reach. I will have to trim it down this year though. It starts to get too unruly and annoy its neighbor. 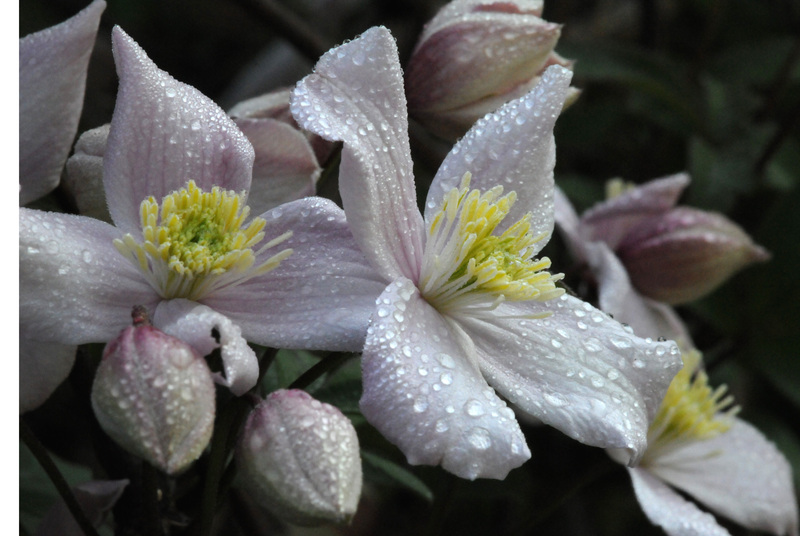 But its beauty got hold of my heart; I added two more Clematis to the garden: a Crystal Fountain and a Belle of Woking. To quote Forest Gump “life is like a box of chocolates….” well, bare-root plants are like a surprise waiting to happen. I’ve never seen such a large, full bloom of those nor that delicate color. It is obvious to me that your nurturing environment helped those scrawny bare roots take hold Pris’. You must have great bees!! Sailing on the Great South Bay last weekend gave me the opportunity to watch the baby Monarchs flying North across the bay in hundreds… once in awhile they’d rest on the boat main sail, then take off again when they got clearance from the earth’s magnetic pull on their “fly way” to Canada for the season…Magical!! wonderful surprise, indeed! they’re beautiful.